I am now mostly recovered from 10 days in Monaco and attending the 4 day Monaco Yacht Show. I am please to report that the show was very up beat and well attended by serious yacht owners. There were a number of new yachts in the show and a good number of vessels over 70 m. I have to say it was a sight to behold looking down into the harbor from the heights of Monaco. If you have never attended the show it is well worth the time and money (not cheap) to experience this event. It is quite different then the hustle and bustle of the Fort Lauderdale show or the hassle of the Miami show. I will not detail the great meals and wonderful wine that were enjoyed but let me say that without question Monaco has some of the best restaurants in the world. The Monaco YACHT show, not BOAT show is a much more dignified affaire then other shows around the world, with all of the pomp and ceremony you would expect in one of the most royal and riches city (in fact it is a principality) in the world. The Royal visit by the new Prince Albert was a low key, warm and cordial event very in keeping with the style of his father. There are a number of Black Tie affairs and cocktail parties over the course of the week. I would say that the , Inc. captains party held at the Monaco Yacht Club and the Boat International party on the grand patio of the Hotel were two of the more elegant events. Bugadi had their new sports car parked outside the hotel. You could not help put stop and admire it’s design, 0 to 60 in 2.3 seconds and a price of $1,800,000, having said that, lets move on to the yachts. In my opinion one of the vessels, the 117’ Royal Huisman ARCADIA was the jewel of the show. This yacht is everything you expect from the worlds top sail boat builder. She is a perfect blend of sailing details and long range cruising yacht. I cannot really put the label of “explorer yacht” on this fine jewel as there are details that I feel conflict with the essence of an explorer yacht. I can go over what these details are with anyone who would like to know via e-mail or phone. ARCADIA is a fine a vessel in design and execution as I have ever seen. The thought that went into the interior details from the use of the over head beams to create the air conditioning soffets to the deep freezers built into the galley floors is exceptional. They have blended design and practicality into many aspects of the vessel. In the crews quarters and on the steps they have used varnished hard wood edges with “Amtico” center sections in the high traffic areas. I would say that 90% of the people who walked through the boat had no idea what they were walking on. In true sail boat fashion the bridge is done in teak with natural finish teak floors and drain areas by the doors. Few owners will allow you to do this and it speaks volumes to this owners knowledge and thinking. There is also a wet locker in the galley next to the side door with drains and ventilation. The crew table in the galley has a rim that lifts off and flips over, one side being flat for harbor use and the other with sea rails around it. Of course the galley stove has a system of sea rails for cooking at sea the edges of the counters have sea rails. Most would miss the detail of adding a curved bottom on the sea rails to make it easy to clean the counters and avoid dirt and grime build up that happens when you have right angles, not this group, you see it through out the boat. I could give you hundreds of details both big and small, the stern anchor, the book shelve system, the dead lights in the baths, the draws for garbage, the piping systems, but the thing that really sets the boat apart is the attention to the smallest details, consistently executed in every area of the vessel. So as you can see I like the boat! My humble congratulations to Royal Huisman, Mr. Arjo Span, the project manager who was kind enough to show me around, all of the unnamed workers at Royal Huisman, the designer’s (there is a long list with Tony Castro leading them) and of course the owners who made ARCADIA’S creation possible. As to the value of the vessel, replacement cost is quite phenomenal, in keeping with the vessel. Please Contact Me should you are interested. 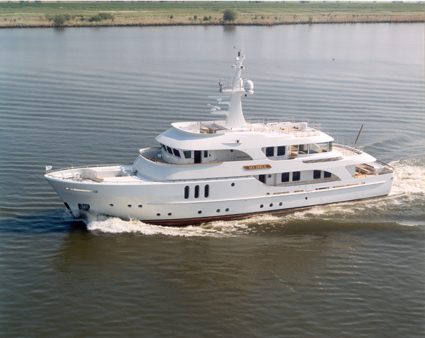 The new Moonen 114’ is a blend between a mid and forward house design explorer. In my opinion her interior and exterior design elements are a study in modern design elements blended with traditional wood finishes. Moonen has carried this off very well over all. The use of curves and rounded edges softens the exterior lines and gives it a modern feel while blending a classic high bow and forward boat deck of a sea going vessel into the generous house structure. The interior carries this modern/ classic feel forward with the use of modern loose furniture against horizontally seamed wood paneling and clean edges. Over all the boat has a solid sea going feel with good attention to detail in all areas. I was very pleased with the engine room and the lazerette but I do find the launching system for the tender to be a bit over engineered and wonder about it’s long term reliability. In many other areas of the boat you can see where this study in engineering paid off very well. Small things like having the BBQ and wet bar area covered by one large lid with gas ram assists and in the clean design of the opening system for the hatches on the boat deck for both the tender (life boat) and a HUGE storage area, ( can’t have to much deck storage) and the stunning design of the stainless steel support for the Bimini top or the shower head built flush into the side deck over head next to the side boarding ladder. There is just one area in the boat that I feel needs definitive work, not in execution but in concept and design, if you are interest you can Contact Me. I think the boat is one of the best I have seen Moonen put out, a well done boat over all. As to value, please Contact Me if you are interested. The last boat in the long range category is another Moonen, this one a few years old, it is the Moonen 92’ now called POSEIDON, she was built as the Bradford 92’. She is a raised pilothouse Vripack design which I am sure most of you are familiar with. 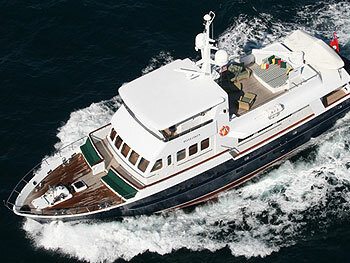 Built in 2004 she was taken back into the yard for some interior changes and small refit. The boat shows very well over all and has proven herself as a solid cruising vessel. 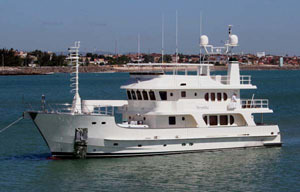 She is presently on the market for EURO 4,975,000. Give me a call if you would like more info on her or to discuss her in general. Now I am gearing up for the Fort Lauderdale Boat Show. I am please to say that I will have "VERONIKA" the new 95’ INACE Explorer in the show and BELEZA the 83’ in the area. I am also very happy to say that IMPETUS the 95’ INACE Explorer that was launched last year has made the short list of five vessels for the Super Yacht Society best Yachts from 20 to 30m. I am going to have to dust off my black tie to attend the ball this year. If you would like more information about the show or some of the new designs, please drop me a e-mail.